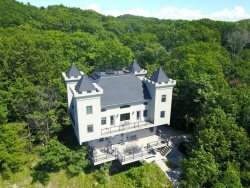 This one of a kind home is the perfect for your next family vacation! CC & Water is directly across the street from Grand Haven State Park! Grab your beach towels and head down about 15 steps, across the street to the warm, white sandy shoreline of Lake Michigan and relax, after all, you are on vacation! This home has a colorful classic cottage feel and unbeatable location. This vacation home is minutes away from all of your favorite "things to do!" This home offers 2 separate living spaces all for you to enjoy with your family! The upper level features 4 bedrooms and 1 full bathroom. There is a beautiful covered porch for you to enjoy coffee in the morning or magical sunsets in the evening. 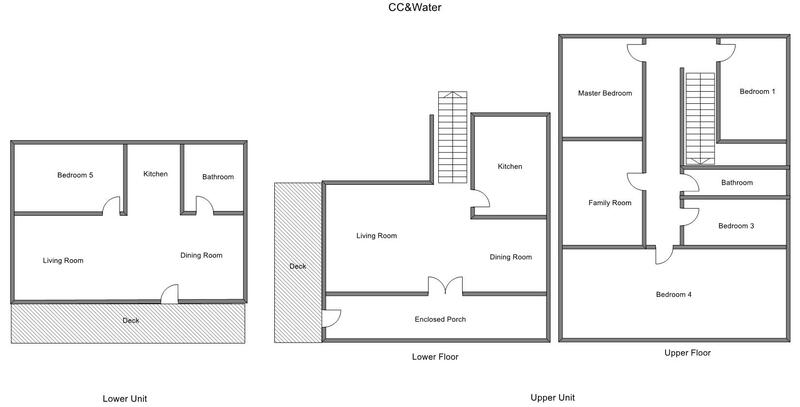 The lower unit has it's own kitchen, living area, full bathroom and 1 bedroom. The lower unit also features a huge deck that is ideal for catching some rays without getting sandy from the beach. Note from Owner: "Steps away is a new restaurant "NOTOS at the Bilmar" on the beach with outdoor decks. You never have to drive! You can walk to the Grand Haven State Park, the boardwalk, pier, downtown shopping, musical fountain, restaurants and more! This has been a great family property for 28 years, we hope you enjoy it as much as we have!"